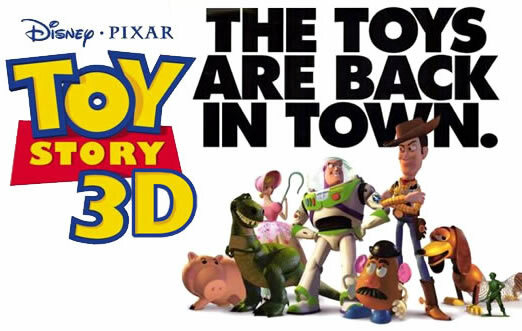 I’ve always been a huge Toy Story fan. We had a Buzz Lightyear back in the day and probably a Woody. And is there a house in America that did not own the Potato Heads? I seem to remember a bunch of other vegies as a kid: cuke, carrot, pepper. Anyone else remember these? When Jana asked us to see the 10:10 3D showing tonight we could not resist. I am convinced that we were the only ones in the theater that paid (tonight is Optimum Triple Play free night – we only have double). We could have also been the only ones over 25. And of course we were the only ones tearing up at the end when Andy and his mom are in his empty room as he is leaving for college. No seriously, I can’t get away from this crap. Jana: Mom, are you crying. Hey, it was still Tuesday! Nonetheless, it was fun and I only napped a little bit at the beginning because, well because it was 10PM on a Tuesday night for G-d sakes. Long and short of it, Toy Story is still great the third time around and kids leaving for college will haunt me for at least a few more months. Well kids, it’s Tuesday and I am not gonna lie, I might be almost all cried out after this bittersweet roller coaster of a week. There are a only a few things I am truly sure of after all the excitement of graduating my second and last child. Here is my takeaway from the whole experience. 1. If one more person uses the term ’empty nest’ I am pretty sure I will have to just punch them in the face. Enough with that crap already. Empty, shmempty, we all know they come home with laundry in tow and lie on the couch like they never left. And we love it. Period. And then they leave. And we kinda like that too. Period. I kept thinking about that all weekend. How being a parent with kids was who we were. It defined us in our community, throughout our days, in all our planning. It was ‘all about the kids’ (right Jo?). And then it was not. Or not exactly ‘not’ but kind of ‘hey we can maybe go back to the way it was before we squeaked out the puppies’. 3. Being a fast learner I get that as soon as I become used to this next stage these rotten kids will up and get married and have their own kids and throw me into the lead role in a friggin’ lifestyle commercial for irregularity (if you know me that is highly unlikely), or osteoporosis meds. And there we will be again, adjusting. The only constant is change. (another sentence I have heard ad nauseum this week – another comment worthy of face punching). Or back to the old love child in me: To everything turn, turn ,turn, there is a season… damn I always hated that song! And if I am not mistaken it might have been the theme of my high school yearbook. because we’re all cried out. Nope, you don’t have to worry, I did not have signage installed in front of my house. This amazing shot was sent by my crazy friend Joyce, who is always thinking of me and sending little tidbits of the absurd from her phone. You may remember the famous ButtPaste post that she inspired. I am thinking of putting her on staff. I believe this shot was taken in Coney Island. Now there is a big surprise. 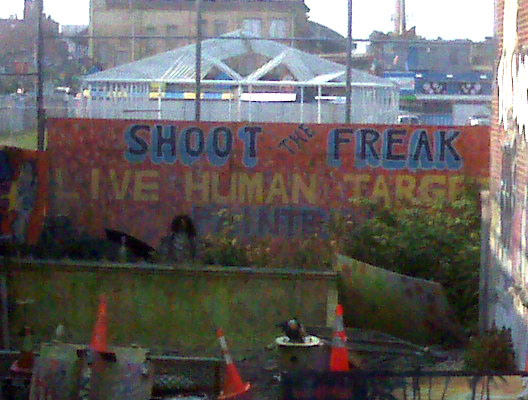 Live Human Target… doesn’t get much better than that, huh? I know what you are thinking, “She has finally snapped. The pressure of her son’s graduation has snipped the remaining thread she was hanging by”. Long and short of it, Danny’s brand of jeans are nowhere to be found sending us on an exasperating quest. Some bizarre storm blew through a sliver of Long Island leaving in its wake the worst damn gridlock I have ever seen and the AC in the kids’ car is spewing ice cold water on our feet every time we make a turn. Honestly, none of this matters. 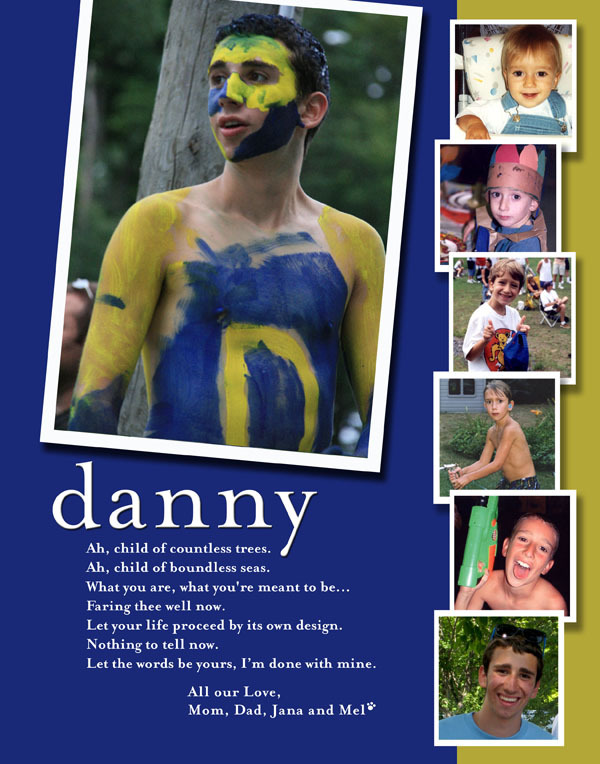 But it does give you a little glimpse into the type of day that Danny and I had – the last day together before graduation. And there it is folks: The Last Day. Staring me down with its beady little eyes. Making me threaten to curl up in a ball and hide under the headless mannequins in the mall while searching for the perfect pair of boy jeans and finally letting it all out with either a primal scream or uncontrollable sobbing. (both of which are not all that desirable to witness your mom doing when you are a 17-year-old boy who is also at the end of his rope). So we found jeans and the car will wait in line to get fixed. And I, being one who with a strong distaste for drama, did not lose it at the mall. It was tempting, but I used restraint. The graduation gown hanging on the back of the door. And the tape loop of a little boy turned man furiously ran through my mind. Legos. Why can I not stop thinking of Legos? And blocks. And Brio trains and bridges on the basement floor at 6AM Sunday mornings when I was dying to sleep. And little blonde bowl haircuts. Apple juice – why is the smell of apple juice so damn nostalgic? And Axe, why do I tear up at the thought of the whole upstairs smelling like Axe Body Spray? Could I actually be craving the smell of sweaty soccer socks? Have I lost my mind or would I give any amount of money to drive one more carpool or sit on the sidelines of a soccer field in the broiling heat/pouring rain/freezing cold just one more Sunday morning in Center friggin’ Moriches or better yet Ronkonkoma? This is what mothers do at times like these. We reflect. And we share. And we promise our sons we will keep it together when everyone knows that keeping it together is actually the last thing we are skilled at. So here’s to the class of 2010.
as they watched us drive away. 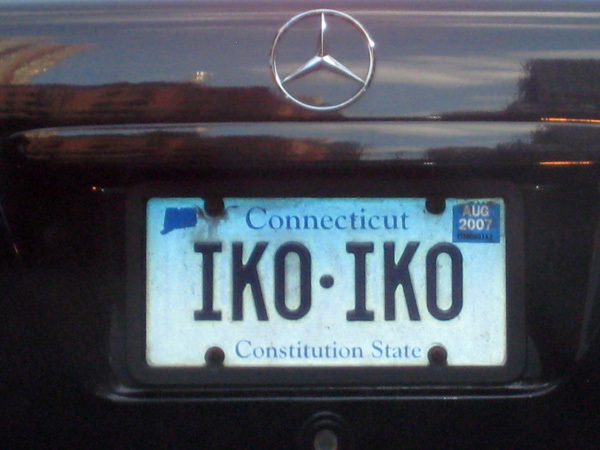 We were behind Mr. Iko Iko from Connecticut on the way out of the Midtown Tunnel on the Manhattan side. Luckily we stopped at a red light as we made a left towards the FDR. Both Gary and I felt that this was the license plate we were most jealous of so far. To the point where we considered seeing if it is available in New York. Of course everyone knows it would be way cooler if it were from Louisiana. But what is the shot it is available there? Oh, to always have a charged camera. I would have been really cranky if I missed this one. After a good Time to Cry Tuesday it is always fun to follow it up with a Time to Puke Wednesday. 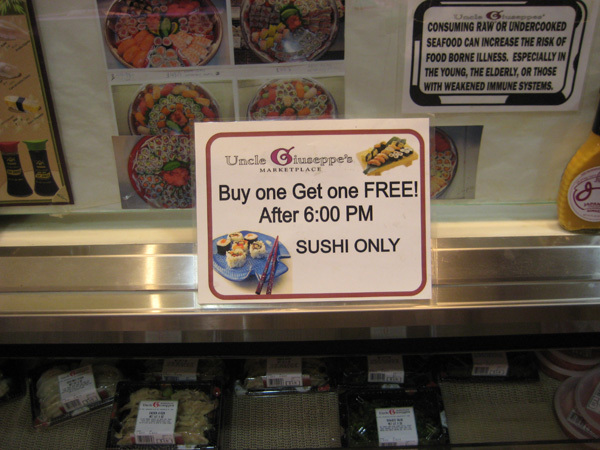 Buy One Get One Free Sushi? Consuming raw or undercooked seafood can increase the risk of food borne illness, especially in the young, the elderly, or those with weakened immune systems. Yikes, check your guest list before you serve the sushi, kids. Certainly the (almost) day old kind. There are times in your life when you simply have to let it go. When you are a parent – and a control freak to boot – letting go is not the easiest thing to do. But I know better. Time marches on and either we march along with it or we get trampled. Ok, so maybe I feel some boots on my back right about now. And I know I am not alone. So, to all of you who are trying to march into step with the graduation class of 2010, here it is: the Time to Cry Tuesday post about graduating your youngest child. 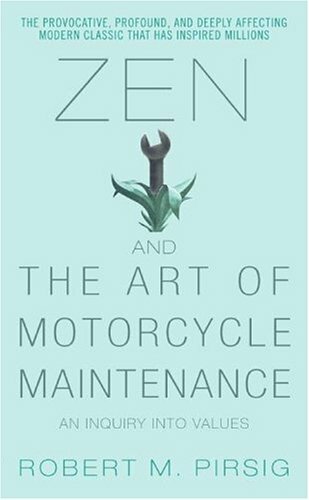 The other day, during the 4-hour end of school/pre-camp errand, Danny and I found ourselves in the bookstore and I came across Zen and the Art of Motorcycle Maintenance by Robert M. Pirsig. This 1974 novel was one of my most favorites back in the day – whenever the hell ‘the day’ was. Maybe High School, or college. I like to recommend some quality books to my kids in between the trash so I suggested that he read this. After being rejected by over 121 publishers it went on to sell over 4 million copies and was translated into 27 languages. I suppose I was not alone in my love for this book. While he browsed, I stopped at the Starbucks to try to alleviate the sleep-deprived haze I found myself in that is all too familiar this time of year. I began to refresh my memory by reading the back of the book. Up until this moment I had done a damn good job of holding it together. He is ready. He is excited. He is moving on to the next chapter of his life with the confidence and unbridled passion that only a young man of almost 18 could have. And that was when it happened. I broke. There in the Starbucks while ordering the grande iced latte (not even half caff, for G-d sake) I could not breathe. What if I had not imparted enough to him? Could I have done more? Could I have ‘lived better’ by example? Why did I never take a motorcycle trip cross country with him when he was younger ? (ok, that one is a stretch) Wait, I need a do over! I am sure there is some colossal parenting task I did not achieve well enough. Seriously, it went too fast, how could he make it without me? My friends, the road is long. And then it ends(ish). But as we who have graduated the siblings before these kids know, being a parent is a life-long job. And this stage is in many ways more fun than any of them. They are the people we grew from babies. To my boy, may we always have days like these past few weeks we have shared. Thanks for humoring me through them. And for making me so very proud to be your mom. I love you. Now go and be all you can be.